These drops can be used in a number of ways - mixed with moisturiser or foundation or alone as a highlighter, which is my preferred method. I start with one drop on the high point of each cheek bone and then add some more if I want to build intensity. I then use whatever is left on my finger on my cupids bow. The texture is thin but not watery so it doesn't disturb the base underneath and the glow that the drops give can be built up from subtle to "seen from outer space" levels. I have two shades - Moonlight and Sunlight. They are both similar in colour, with Moonlight being a soft, golden-champagne shade and Sunlight being a warmer, more coppery shade. They are sold in both SpaceNK and Beauty Bay. Tarte Tarteist Pro Glow Liquid Highlighter - again, another mini sample that I received with a Sephora order. This is a bit creamier in texture than the Cover Fx drops and definitely has more shimmer to it. The champagne gold colour is absolutely stunning and the shimmer only adds to the sheen this gives. It isn't at all glittery but is more evening/night-time appropriate for my taste. Marc Jacobs Dew Drops Coconut Gel Highlighter - I wanted this product for so long and it sold out quite quickly put my patience paid off and as soon as Sephora re-stocked it, I had my card out. (I use MyMallBox to ship my Sephora orders - they're fast, affordable and easy to use). Like the primer in this range, this product is lightly scented of coconut, but if you're not a fan of that scent, don't be put off as it's very faint and soon dissipates. The texture is a light gel cream and although the word drops is in the name, the product is actually dispensed using a pump. Like the Cover Fx drops, this can be used in a number of ways - mixed with primer or foundation or used as a traditional highlighter, which is my preferred choice again. It is a very flattering pale gold that makes my skin look very dewy, healthy and lit from within. Worth the wait! Finally, I have Charotte Tilbury Hollywood Beauty Light Wand, which is my most recent addition and oh my, it's a goodie! This is a beautiful champagne shade and it really adds a 3D effect to the cheekbones without looking metallic or holographic. It has a soft cushion applicator, which I both love and hate. I love it because I can dab it directly on my cheekbones without disturbing my base, but I hate it because if I squeeze too much out, I can't put it back in! I can forgive that though because this product gives the most sophisticated, luminous highlight that makes me look very healthy and glowing. It's quite possibly my favourite discovery of 2017! I just hope I don't finish the 12ml tube too quickly! 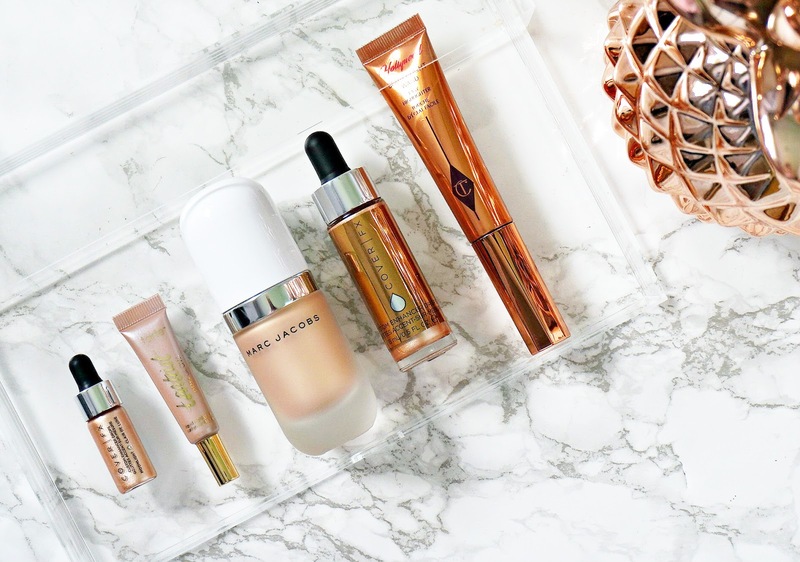 Do you prefer liquid or powder highlighters? I'd love to hear your thoughts on these!